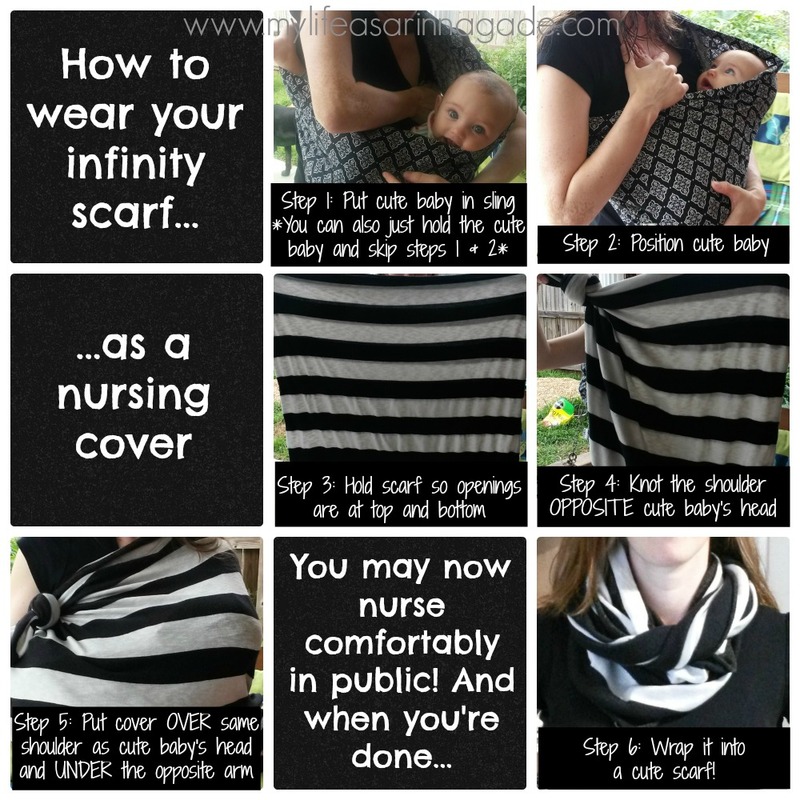 The Infinity Scarf has gotten a lot of buzz lately and for good reason; I love mine. Not only are they cute as scarfs, but the right sized scarf can double as a discreet nursing cover so you don’t have to hide in a bathroom stall at the grocery store when your baby gets hungry. Although I don’t always wear it as a scarf (it’s July…in Alabama…), it’s so easy to stuff in the diaper bag and always have on hand when I’m running errands. I made my own and it’s super easy to do. It’s literally one strait line stitch (is that even sewing terminology?). The absolute most important part of making one is getting the right fabric. Repeat after me: JERSEY KNIT. Hobby Lobby has just brought out their fall line and it’s too cute! Here’s the tutorial I was inspired by. Thanks to my 1990s childhood, my brain brought to reference knotted shirts. It was just what I needed for the scarf to fit right. I pair mine with my Seven sling and it works great. You could just as easily use this without a sling, though. Here’s a picture tutorial you can print out to remind you what to do!